Brazilian coffee is more than just a drink to get you going in the morning, or an afternoon pick me up. Brazilian people are quite proud of their coffee. When someone offers you a cup of coffee in Brazil accept it. For it is an invitation to put down your business for a few minutes and enjoy the coffee and the conversation that goes along with it. Brazil produces about one third of the world’s coffee supply. It grows various bean types such as Bourbon, Typica, Caturra, Mundo Novo and Arabica which is the most popular. Arabica coffee is what goes into most of the higher-end coffees. Usually found in coffee shops and on grocery shelves. Coffee represents a large part of Brazil’s economy. Brazil is also the second largest consumer of coffee, being surpassed only by the United States. The Brazilian people work hard to produce coffee, this is evident in the amount of coffee they supply to other countries. This is the Brazilians way of sharing their culture and traditions with other countries. The climate in Brazil is quite favorable for growing coffee. It is hot and humid with a rich soil that coffee plants love. However, Brazil does not have the high altitude that other coffee producing areas have resulting in less acidic tasting beans. The two main processing methods for growing Brazilian coffee are the dry process and the wet process. The dry process consists of drying the coffee while it is still in the fruit. This results in a sweet smooth tasting coffee, but beans take longer to dry in this manner which can lead to fermentation. Brazil has spent large amounts of money creating new drying processes to prevent fermentation from happening. The second method is the wet process, which consists of removing the four layers that surround the coffee bean. This results in a cleaner and fruiter coffee than the dry process. This is a fairly new method and it is not used as frequently as the dry process. So how do you order coffee in Brazil? Glad you asked! Cafezinho: Cafezinho is a strong, pre-sweetened coffee, usually served in a small cup. After you meal, most restaurants will generally offer a cafezinho at no charge. However a cafezinho can be purchased at bars, cafés or or street vendors at any time of day. Truly the most popular style of Brazilian coffee. Descafeinado: As one can surmise, Brazilian decaffeinated coffee. Brazilians aren’t big fans of decaf so you won’t always be able to find it. Café-com-leite: Known throughout the world as café con leche, café au lait or caffè latte. It’s a mixture of more milk then coffee. In Brazilian coffee bars, the server will pour hot milk into a medium cup until the customer tells him to stop, then will fill the rest of the cup with coffee. Sometimes coffee houses will allow the customer to this themselves, by leaving hot pitchers of coffee and milk out. Sugar is then added by the customer. Café-pingado: This is a café-com-leite with a smaller amount of milk and a larger amount of coffee. Café-curto (or café-expresso): Typically served in a small espresso cup, this is a strong and bitter coffee brewed in an espresso machine. that uses steam to create the drink. The customer will then add their own amount of sugar desired. Café-longo: A more diluted coffee than café-curto, usually served in a large cup. Made using an espresso machine. Café-carioca: Also brewed in an espresso machine and served in demitasse cup. Similar in strength to café-longo. Capuccino: Brazilian version of cappuccino. Adoçante: Adocante is a Brazilian artificial sweetener added to any type of Brazilian coffee. There are many great coffee companies in Brazil. 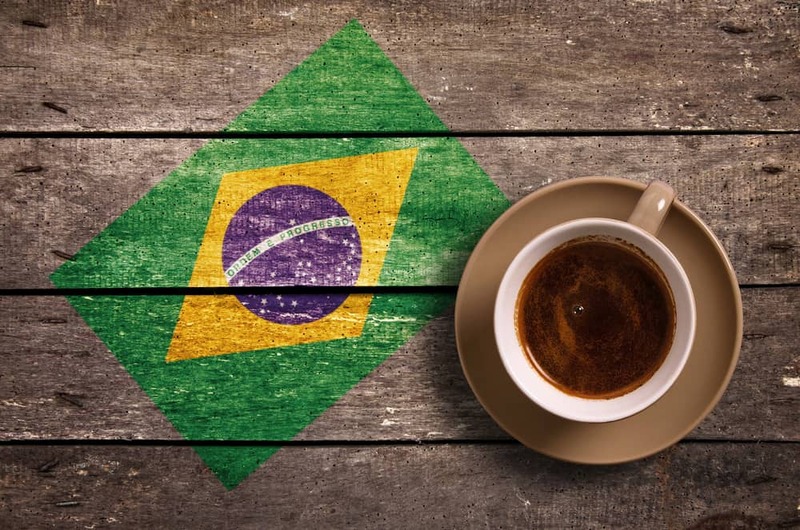 So which Brazilian coffee brand is the best? Like anything else, it all depends on personal preference. Some of the more popular Brazilian coffee brands are Cafe Pilao, Cafe Do Ponto, Cafe Melitta, Cafe Caboclo and 3 Coracoes. Honestly, you really can’t go wrong with any of these. Wet or dry, cafezinho or café-com-leite, one thing is for sure, Brazilian coffees are amongst the best in the world. What do Brazilians eat with their favorite cup of coffee? Pao de queijo, of course!